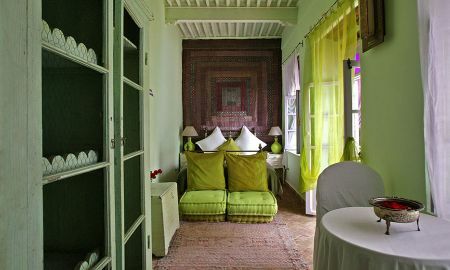 Green anise room set in the ground floor with double bed and separate bathroom with shower styled in Zellige tiles of Fes, chrome vanity and WC. Paprika room located in the 2nd floor, with 2 separate beds or a double bed, separate bathroom with shower styled in Zellige tiles of Fes, chrome vanity and WC. Indian pink suite located in the ground floor with a double bed, sitting area with bench, fireplace, spacious and original bathroom with bathtub, chrome vanity and WC. Extra bed for kids is available (upon request). White and lilac suite located in the 2nd floor with double bed, sitting area with banquette and fireplace, spacious bathroom made from Tadellakt, chrome vanity and WC, hair dryer and direct access to the terrace. Spacious suite located in the second floor, with two rooms, vast living room separating the two rooms and two bathrooms one with bathtub and the other with shower and WC. 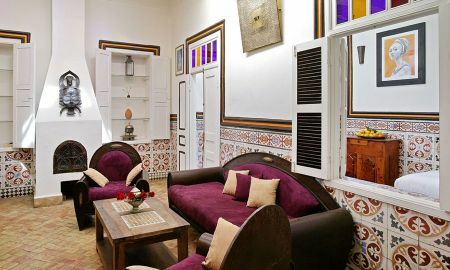 Situated in the heart of the Medina, in a peaceful and calm area, Casa Lila is a fabulous Riad highly recommended by the magazines of art and decoration. 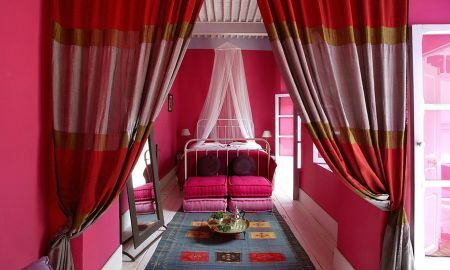 This ancient house, once owned by a rich spice merchant, has been transformed into a guest house composed of colourful rooms and splendid living rooms and balconies where the ambiance is serene and intimate. 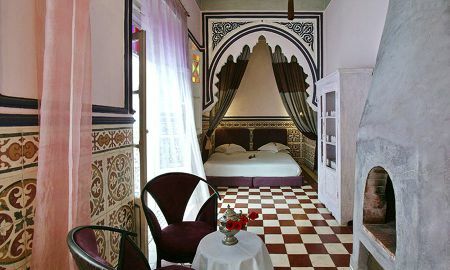 Built around a luminous and lilac patio, the Riad offers ten beautiful rooms and suites and a splendid reading room with fireplace set in the ground floor. 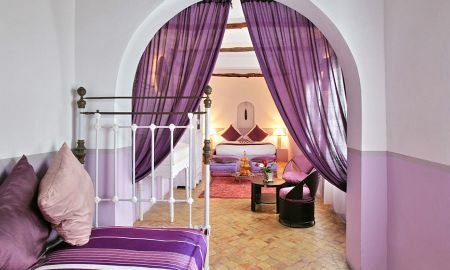 The charm of the riad is due to its mixture of delightful colours an scents which promote calm and serenity. Casa Lila is located in the heart of the Medina, near Bab Marrakech and 5 minutes walk from the beach and the port. From this magic place, you can enjoy the atmosphere of the Medina and go for a walk at anytime of the day.